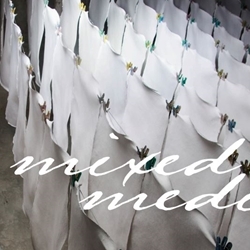 Multimedia art paper is made using cotton rags which have long fiber thus giving exceptional strength and durability. These paper are made using special felts imparting them uneven texture and tooth to give you the best experience of using a hand-made paper. Ideally sized, this paper is suited to be used for all types of drawing techniques with wet and oil media, charcoal, acrylics, pencil and pastel. This paper is also suitable for printmaking techniques including engraving, etching and letterpress.